The leaf sweeper protects lawns, turf and hard surfaces from damage whilst clearing leaves, grass and debris. The leaf sweeper brushes the waste into a collector hopper ready to be composted or disposed of easily during all weather conditions. 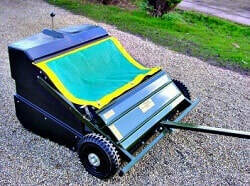 A push leaf sweeper is the ideal choice for small lawn areas whilst towable sweepers are best for larger lawns. Our leaf sweeper range can be towed behind an ATV, UTV or compact tractor and is suitable for gardeners, groundskeepers and estate owners. 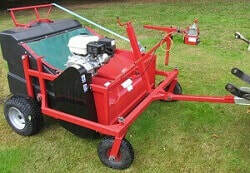 ​The towed leaf sweeper MTC120-E from Wessex has a perfectly balanced hopper collector, secured with a spring-loaded pin to keep it in position when the sweeper is in use. The hopper can then be emptied using a hand operated winch. The leaf sweeper collector brushes are designed to protect lawns and delicate turf surfaces from damage and stimulate new grass growth by its brushing action. 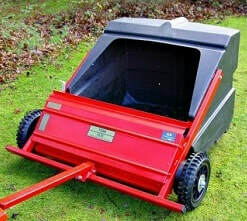 This leaf sweeper is ideal for using on large estates, parks, large garden lawns and sports turf. 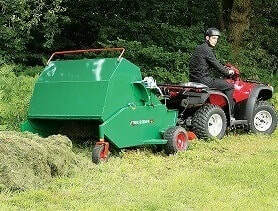 The leaf sweeper collector can be self-powered by a 5.5HP Loncin engine or PTO driven and trailed. Suitable for lawn areas such as large gardens, estates, sports turf and parks. Adjustable brush height via a turn-bar on the front of the leaf sweeper. High capacity hopper. Easy activating tipping latch. Lighter and stronger than previous models. Manufactured in the UK using modern techniques. Cost effective and easy maintenance. The EPB leaf sweeper from SCH can be used for a multitude of tasks and will work well on lawns and paddocks as well as on hard surfaces such as car parks and drives, making it very versatile. When used on lawn or paddock areas, the lawn sweeper will encourage the growth of healthy grass by promptly removing manure and other droppings, whilst maintaining the grass free from diseases. This leaf sweeper has four rows of height adjustable brushes which rotate at variable speed, collecting the waste into its rear rust-proof collector. The Honda engine of this leaf sweeper has a speed control gear box with centrifugal clutch which stops the powered brushes from revolving when reducing the machine's speed. Fitted with a 50 mm ball tow hitch and replaceable brushes. Hitch: 50 cm ball hitch standard. Clevis or tongue hitches optional. This leaf sweeper made from robust construction will withstand prolonged heavy use. A differential mechanism on the brushes allows the leaf sweeper to be manoeuvred into tight corners without the wheels scuffing. The differential mechanism allows both ground wheels to drive the pick up brushes giving it superior sweeping power. The height adjustment is simple. The main drive is transmitted via metal gears.The solid plastic collector of the leaf sweeper is rust proof and simple to use. 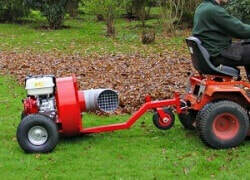 Reversing into the tipping heap is easy with this leaf sweeper as it only has two wheels in contact with the lawn. A useful collector's sheet is supplied with this large capacity sweeper. ​This leaf sweeper has a sprung floor to allow materials such as sand to flow back through the base of the hopper and at the same time collect debris such as leaves and twigs from yards and other hard surfaces. A differential mechanism on the brushes allows this leaf sweeper to be manoeuvred in tight corners without the wheels scuffing by using a simple height adjustment. Both wheels drive the pick up brushes giving excellent sweeping power. The main drive of this leaf sweeper is transmitted via metal gears. A cover plate is supplied with each machine to cover the mesh floor in sweeping operations where all debris is required to be collected. ​​​This leaf blower blows great amounts of leaves into piles getting them ready for collection. The leaf blower in effect, replaces a manual rake making it quite simple to clear leaves from flower beds, edges of drives and pathways. A hand conversion handle is supplied as standard with this leaf blower​.